London, 3rd April 2019: Celebrate Easter 2019 in style as two of the world’s most iconic brands, Fabergé and The Ritz London, launch a unique experience to ignite the senses. Renowned for their luxury and elegance, this bespoke Easter collaboration is the perfect marriage of heritage and modernity. The Mosaic Egg was one of the most technically sophisticated and extraordinary of all the Fabergé Imperial Easter Eggs, and took over a year to craft. The Egg was the work of Fabergé’s first female designer, Alma Theresia Pihl, who was inspired by a petit point carpet she was embroidering as part of her marriage trousseau. It was one of a series of 50 eggs made and delivered to the Russian Imperial Royal family, all unique and individual in their design. Today, the Mosaic Egg is part of the British Royal Collection. Fabergé’s modern-day creations take inspiration from original pieces. The Treillage egg pendant was inspired by the Diamond Trellis Egg and the Mosaic egg pendant is born from the Imperial Mosaic egg. 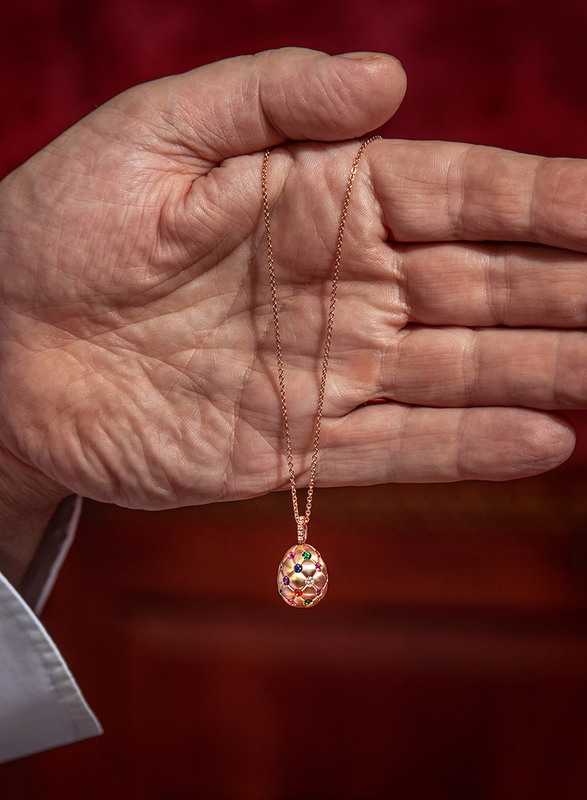 In keeping with Fabergé’s history for surprise and ingenuity, John Williams has created a luxurious Eggs Fabergé dish which closely mirrors the multi-coloured Fabergé Treillage egg pendant. Using the inside of an egg shell as a mould, the delicate dish is created using the very highest level of technical expertise. The dish features a soft-boiled quail’s egg encased in a lobster mousseline, decorated with a circular pattern of vegetable gems (including aubergine, courgette and heritage carrot) which have been set into pasta to represent the colours and quilting of the ruby, tsavorite and fire opals gemstones set into the rose gold of the Fabergé Treillage egg pendant. The edible Eggs Fabergé is served on a bed of Oscietra caviar, and finished with a langoustine à la nage sauce. 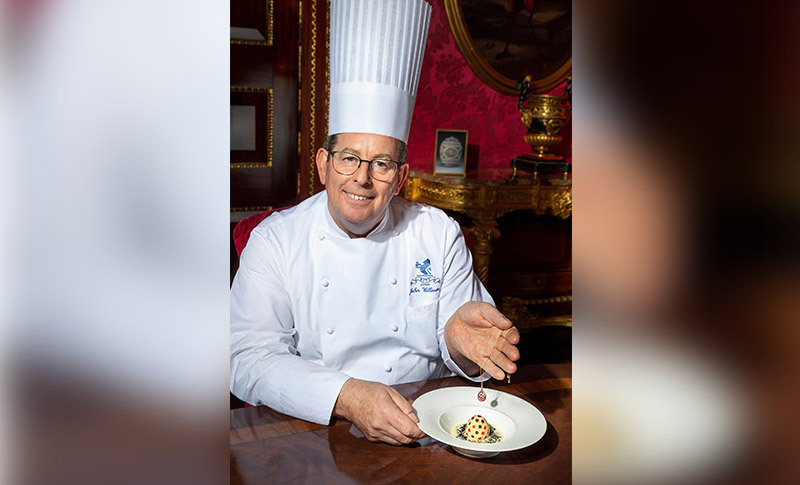 This unique Eggs Fabergé dish will be available for guests who reserve the three-course Fabergé menu in the Michelin-starred Ritz Restaurant during Easter Week. This Fabergé menu includes wine pairings expertly selected by the hotel’s Head of Wine Giovanni Ferlito and a limited-edition menu card, signed by both John Williams MBE and Sarah Fabergé. The Fabergé menu will be available during lunch service between Monday 15th April until Monday 22nd April inclusive, for a maximum of 10 guests per service (due to the complexity of the dish) and is priced at £295 per person. An overnight residential Fabergé experience at The Ritz is also available for guests arriving between Monday 15th April and Monday 22nd April 2019, inclusive of the limited-edition Fabergé three-course menu in The Ritz Restaurant. The residential Fabergé experience starts from £1,155.00, inclusive of Value Added Tax and English Breakfast, based on two people sharing. As part of the Easter celebrations, Fabergé will be exhibiting both jewellery and timepieces in Long Gallery at The Ritz London. Before or after lunch, guests can visit the Fabergé pop-up salon, meet the people behind the name and discover the exquisite new collections. There is also the opportunity to design your own bespoke Fabergé jewellery at Fabergé’s by-appointment London salon for those seeking a truly unique creation. For reservations and booking information, please contact The Ritz London’s Reservation Team on +44 (0)20 7300 2222 or at reservations@theritzlondon.com.